While STEM heavy teen programming has been happening for well over a year, Lance and his team were recently moved into the site of the library's former bookstore, which gives the a good deal of dedicated space, plenty of storage, and a big picture window welcoming teens into the room. Note Birmingham's unofficial slogan on the window, "we're glad you're here". “This is all still kind of in transition, we had the teens vote on the colors, though I did mandate we have one green wall so we could do some green screen work.” The teens will also vote on the name of the space as regular programming begins. 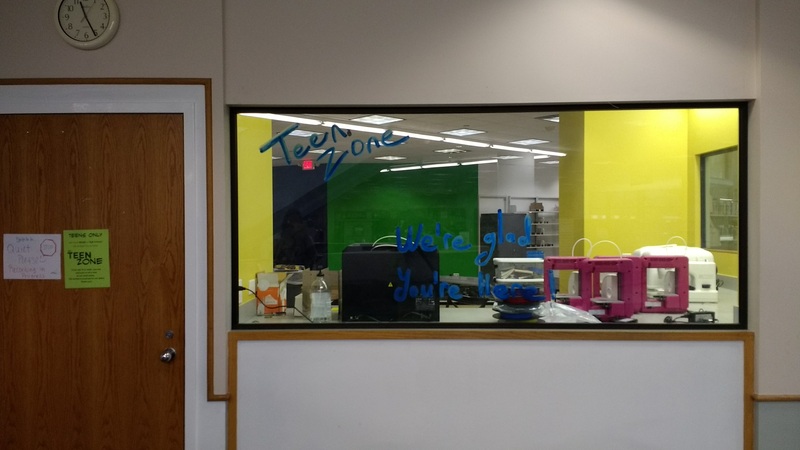 When you first step in you are greeted by an appetizing workbench and "makerspace" corner. A row of ready-to-be-hacked Cube 3D printers (Birmingham was a recipient of the 3D systems Cube grant) and a stack of sewing machines help set the stage for the hands-on environment, and a large, partially disassembled flat-screen television lay's across the workbench. Lance explains, "one of the teens that works with regularly was asking about parts for a tv…he’s been building different science projects, and all sorts of things with it.” A mentor happened to have one laying around, and it seems it has since become a permanent installation in the makerspace. 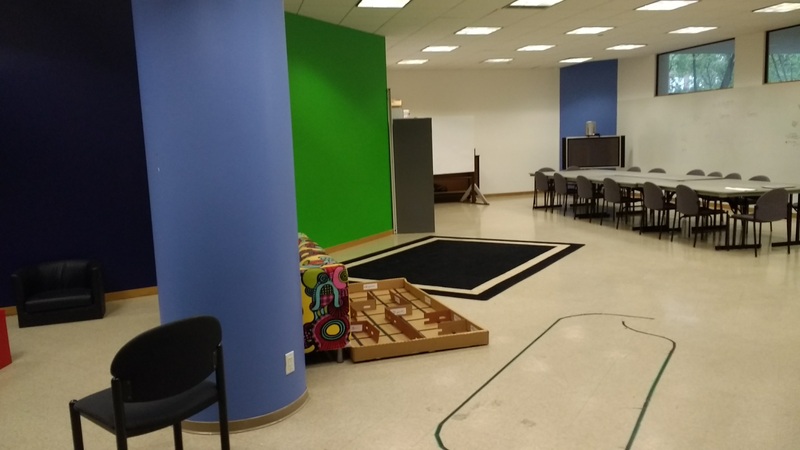 As you make your way deeper into the space, you see a large green-screen wall, and a workshop area with flexible furniture, large monitor, and an area for several desk-top computers a Best Buy foundation grant will be providing. There is also a large, former-book shelf with numbered boxes stacked. These boxes hold teen's progress projects, so they don't get mixed up with the rest of the projects. While there is not recording studio as of yet, Lance and the Birmingham team have an under-utilized storage closet that, with help from a community recording studio and other funding, will be built soon. They are already partnered with a community organization to run poetry and music production, and they expect to see a lot of interest in the studio once it's complete. They've also got a nice area for hanging out, an element of the culture that will be relatively new to the very workshop and camp-heavy programming they normally host. The staff at Birmingham is very reliant on community partners to make their programming innovative and sustainable. Thanks to a close relationship with the University of Alabama (UAB), engineering students have partnered with the library to act as mentors and plan and host programming. This has given them a leg up with their robotics and coding programs, and they've already had some success with fairly advanced projects. Lance explains that a regular patron joins them on some weekends during planning sessions to assure the teen voice is represented in the program planning. In fact, one of the programs - building cardboard robots - came from this teen patron, and became the cornerstone of their summer engineering camp. “The hardest thing with UAB and the parents is getting away from that strict classroom instructional philosophy.” But the team at Birmingham wants the space to be flexible and welcome to all students, not just those looking for a “geek out” opportunity. Our favorite artifact we noticed was the “robotic house” - a cardboard smart house that houses an arduino, a heat bulb, a cooling fan, a temperature sensor, and more. The house was built by a team of teens and programmed to react according to the sensors. 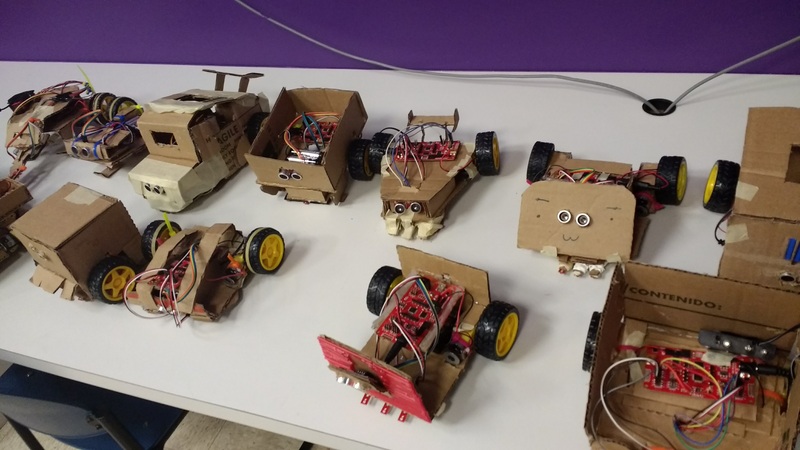 While the space at Birmingham Public Library has demonstrated their robotics and coding chops, Lance and those of us in the YOUmedia community are looking forward to what else they’ll do now that they are an official YOUmedia learning lab. The team at Birmingham is excited, committed, and recognize the importance of giving teens a safe space to gather, experiment, and “Hang Out, Mess Around, and Geek Out”.